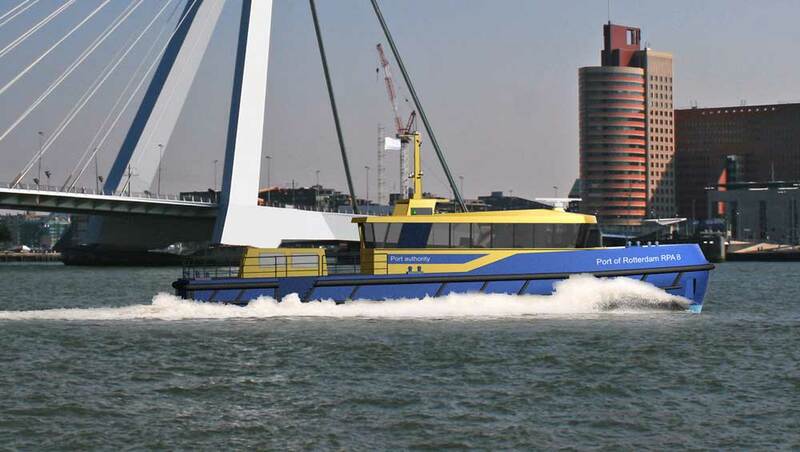 Shipyard Kooiman recently started building a new 25-metre patrol vessel for the Rotterdam Port Authority. The vessel will be delivered in the summer of 2017. The order followed a public tender process in which several shipbuilders competed with their designs. The design incorporates several innovations to improve the efficiency. The principal focal points in the tender were the vessel’s complete life-cycle costs, a minimal amount of emissions and a minimum of wave formation. 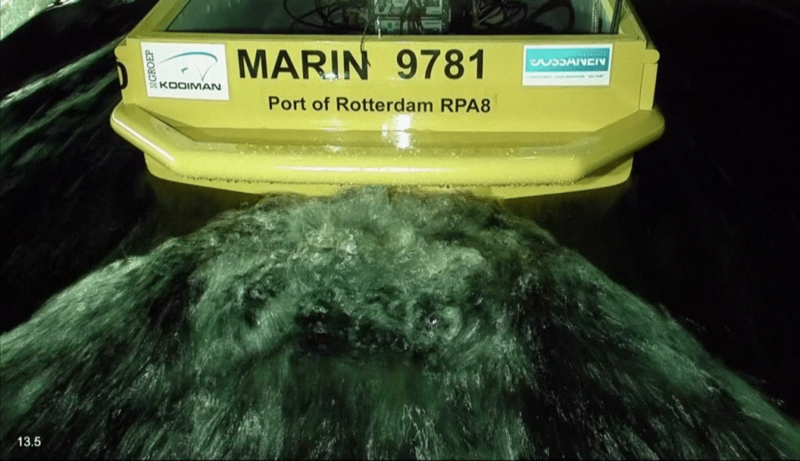 Apart from the fact that the vessel will sail in a densely populated area, with a lot of traffic on the waterways, this is also due to the fact that the Rotterdam Port Authority wishes to set a good example to its clients: it pays off to invest in energy efficiency, both from a financial and from an environmental point of view. One of the competing shipyards, Shipyard Kooiman, contracted Van Oossanen Naval Architecture for the hull design. Working predominantly in the yacht sector, Van Oossanen has built a solid reputation for efficient hulls sailing at high speed-to-length ratios. The design which best suited the operational profile – a rarely used top speed of 30 km/h, and a normal cruising speed of 20 km/h – is a combination of two patented innovations launched by Van Oossanen: the Fast Displacement Hull Form (FDHF) and the Hull Vane®, winner of the Maritime Innovation Award in 2015. The concept of the FDHF is rather simple but innovative at the same time: the vessel is designed to stay in displacement mode at high speeds with almost no running trim, and the complete absence of a “hump speed”. A significant amount of hydrodynamic lift is generated by the Hull Vane®, a hydrofoil-like appendage fixed to the transom. This lift is angled forward, and therefore has a horizontal component pushing the vessel forward. 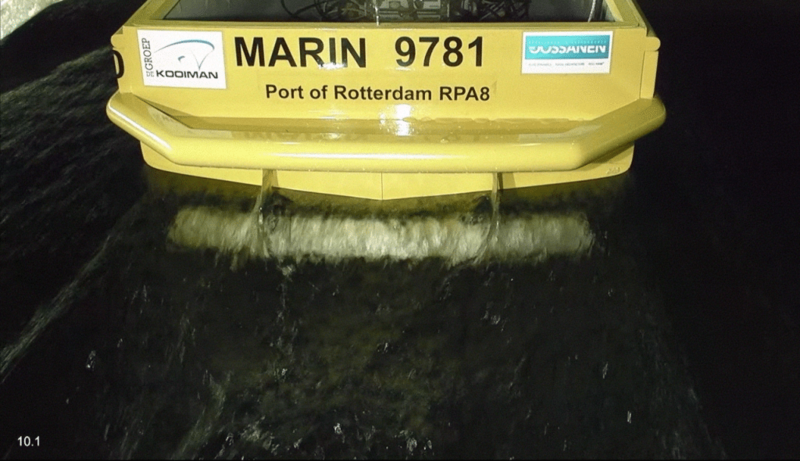 Self-propelled model tests at MARIN with and without Hull Vane® showed that the energy saving device reduces the required propulsion power – and therefore the fuel consumption – by 25% at 20 km/h , by 29% at 27 km/h and by 22% at 35 km/h. 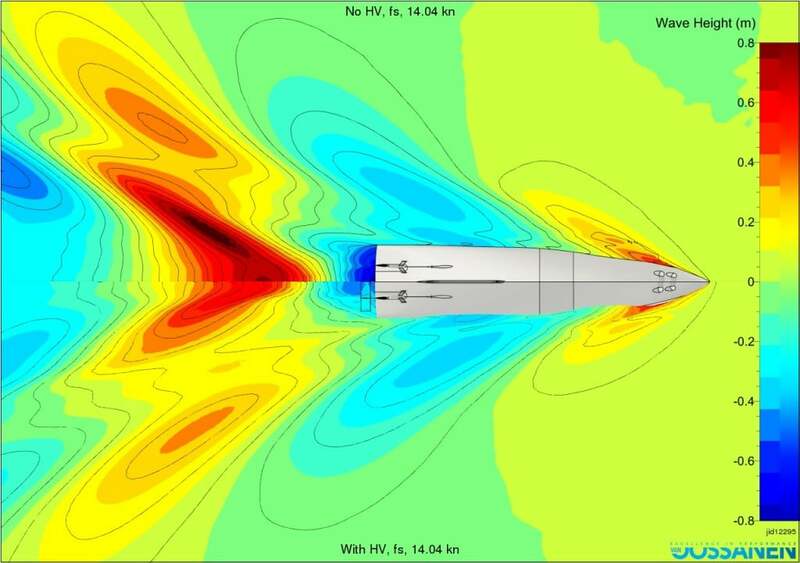 The Hull Vane® also has a marked influence on the wave profile of the vessel. MARIN measured both the wave pattern immediately behind the transom and the waves at a distance. The tender specification included a firm requirement for low wave generation: at 20 km/h, the generated wave at 30 meters from the boat should not exceed 40 cm, which is significantly below the wave generated by the current fleet of patrol vessels at this speed. 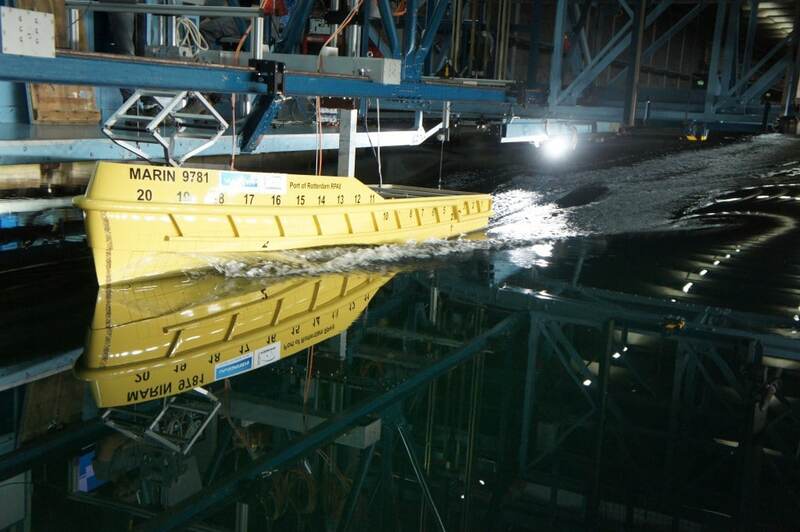 The model tests showed this height to be only 7 cm for the boat with Hull Vane® and 10 cm for the boat without Hull Vane®. This shows that the Hull Vane® is not a “fix for a bad design”, but rather an improvement for a good design, similar to how a bulbous bow is an integral part of a large ferry design. Reducing the resistance means consuming less fuel, and therefore emitting correspondingly less greenhouse gas CO2, and carcinogens such as NOx and particulate matter into the atmosphere. With 350 sailing days per year, the Hull Vane® on RPA-8 reduces the emissions of CO2 by 162 tons, or the equivalent of over 8.000 trees growing for a year. In addition, shipyard Kooiman was able to install a smaller propulsion plant (736 kW instead of 939 kW), which offers a lot of secondary benefits, such as cost saving, reduced ventilation requirements, reduced exhaust systems, a lower noise level and more space in the engine room. Due to the cost savings, there was no net cost for the Hull Vane®. 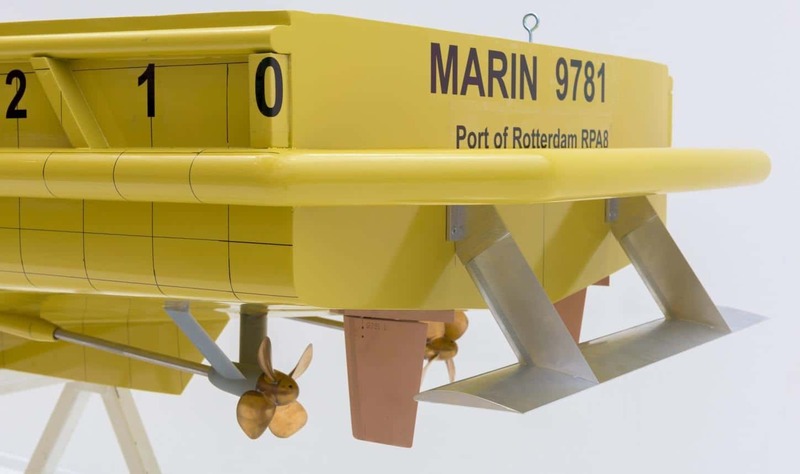 For efficient patrolling at low speeds and a reduction in engine running hours of 40%, RPA-8 will have a parallel-hybrid propulsion installation from Holland Ship Electric. This system allows the boat to be sailed in diesel-electric mode up to 25 km/h on one of the main engines, or with both main engines engaged in diesel-direct mode from 25 km/h to 35 km/h. The engines are always properly loaded, which means more efficient combustion and less smoke generation. Shipyard Kooiman expects the design to become a new benchmark for inland waterway and near-shore patrol and survey vessels. The public tender process proved to be an ideal way to adopt proven innovations and achieve an optimal integrated solution. The key was to not look exclusively at build cost and top speed, but to look at the complete lifecycle costs based on a realistic operational profile.